Pick up a copy of this month's Food Network Magazine and you'll see 50 Easter eggs designed and decorated by artists from each of the 50 states. Through some stroke of luck, yours truly was asked to create little old Rhode Island's egg! I chose the iconic Castle Hill Lighthouse in Newport, which has been a beacon for seafaring types since 1890. It's got the distinction of being on the National Register of Historic Places, and is a peaceful spot to catch the sun setting over the water. For those who want to try their hand at painting their own lighthouse egg, here's a step by step painting tutorial. Grab yourself a 6 pack of white eggs and boil a few of them up just in case one or two crack while cooking. If you're a vegan or want something more permanent, you can buy wooden eggs at the craft store, in which case you'll want to put a layer of gesso or primer on before you start painting. In order to keep the egg from rolling around while you work on it, place it on a folded hand towel for stability. Using pencil, ink, and colored pencils I drew the lighthouse on paper first to become familiar with it. It helped me to choose what not to include. Since the egg is such a small surface you don't want to get too detail-oriented. Try to stick to larger, descriptive shapes. With one of your medium-sized brushes wet the outside of the egg. When it dries to just damp use your watercolors to lay down the colors for your sunset background. Using the blue paint create the horizon line of where the water meets the sky. Let the colors overlap and run together a little bit. Now you'll want to lightly sketch the image right onto the egg. You do this after the watercolor background is on so you can edit and erase as you go. You'll find it a little challenging to draw on a curved surface, so be sure to keep checking your lines by looking straight down onto the egg as you work. I used black acrylic paint to outline my drawing first, then filled in the basics with solid color in order to create a foundational layer. Once the underlayer is dry, focus on creating shape and form by adding in highlights and shadows on the rocks and stones of the lighthouse. Use a light, medium, and dark grey-black to create dimension on the lighthouse roof. Using a thin brush add in the rungs of the balcony railing. Mix up a variety of greens in order to add in some grasses to the foreground. Lastly, add in a little texture to the ocean and - voilà! 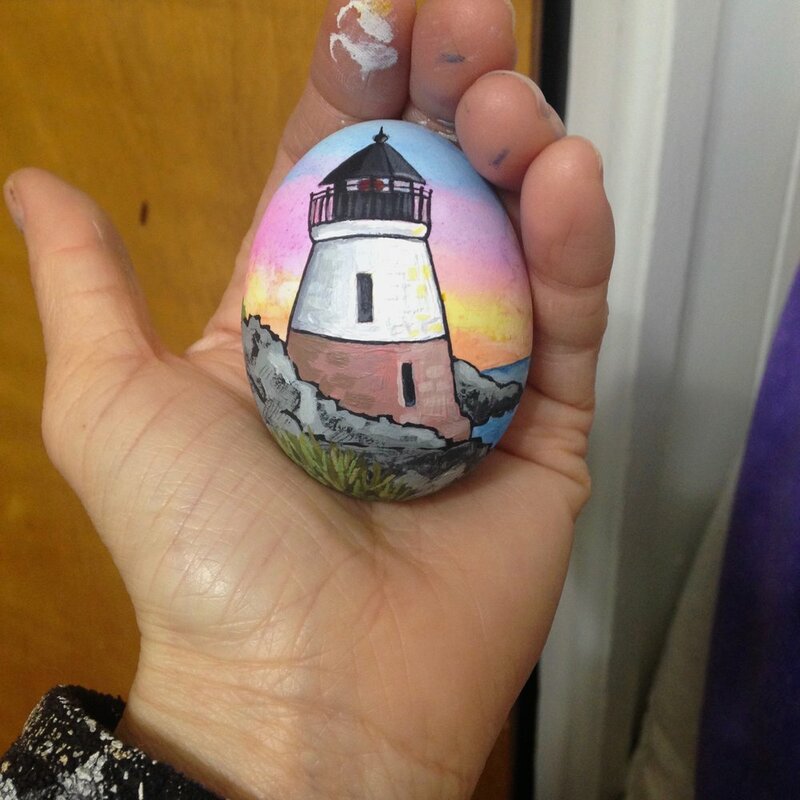 - your "Instagram ready" lighthouse egg is born! If you use this tutorial, post a pic and tag me on Facebook or Instagram! Behold the most recent Creative Devotion Online Art Show is available for your viewing pleasure! The latest rounds of the 48 Days of Creative Devotion and Beyond 48 programs have just ended and I'm happy to post just a small sampling of the more than 1,000(!) visual art and creative writing works that were born during the program. In the 48 Days program everyone makes one complete work per day. In the Beyond 48 program (open only to 48 Days grads) we work for a minimum of 25 minutes per day. It's a process that can be both magical and scary, and I have great respect for all those who have undertaken it! If you'd like to join us for the next round of 48 Days of Creative Devotion go here to sign up or join my mailing list for notification here. 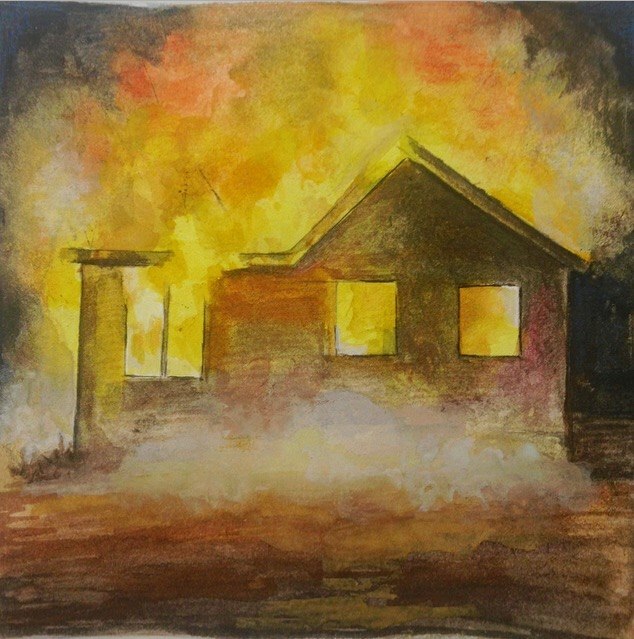 I've been painting houses on fire. I'm not exactly sure why. I was at the tail end of one of the recent 48 Days of Creative Devotion programs, and I decided to paint a sweet little landscape for my daily devotion. Along the way I added a sinking house. The next day I painted another landscape and posted it to the forum, thinking I was done. But, later I decided it was too bourgeois with the mansion overlooking the water and all, so I added a thick plume of smoke pouring out of the window. That was much more interesting. Now I'm on a roll with the houses on fire. What I love about them is the myriad interpretations of what they might mean. Many folks have believed them to be metaphors about the state of our country. Other folks have seen them as spiritual symbols of transformation. And, some have mentioned environmental destruction and wildfires. There's also something about not feeling safe in one's home. And, perhaps, by painting both mansions and shacks on fire there is room for thinking about socioeconomics, or about how tragedy is the Great Equalizer. Me, I'm still not exactly sure what they're trying to say, but I'm enjoying them nonetheless. On a practical level, there's something really satisfying about the juxtaposition of the hard lines of architecture and the loose, organic nature of fire. Practicing how to capture the concept of "heat" through visual means has been a fun challenge too. The colors go from "white hot" to yellows, oranges, and reds, then give way to thick, gray-black smoke. If I'm doing my job, the viewer will feel this heat coming through the work. When you look back on the journey of being an artist who do you need to forgive? I mean, if you've been doing this for any amount of time, there will be people to forgive. The person who ripped off your idea. The person who told you to keep your day job after they saw what you made. The person who balked at your prices. The person who insulted you in front of your peers. The person who promised you that show (or book, or deal, or golden opportunity) and then flaked and disappeared. The person who never paid you for your work. When I look back at my creative journey and start to tally up what I call "a million little humiliations" I get overwhelmed by the sheer volume of people I could forgive. And I feel bitter all over again. Why SHOULD I forgive them? What they did sucked. But then I remember they're not the ones being held back by the past. They're not the ones hanging on to an unresolvable situation. They're not the ones waiting for an omniscient voice to boom from the sky, "You were right! They were wrong!" It's just plain ineffective to live in the wounded place. Talking about this today a dear friend and fellow entrepreneur reminded me that I am not the person I used to be. I am stronger, wiser, more powerful. And because of that I would never be caught alive in most any of those situations I used to put myself in when I was younger, situations that were breeding grounds for stress, anxiety and humiliation. The great irony is that all of those hard moments with all of those jerks are what lead me to a place of greater strength. They're actually the reason my boundaries are stronger. The reason I can say no to opportunities that seem too good to be true. The reason I can spot a jerk, or a drama queen, or an abuser, or a hustler a mile away. The reason I value peace in my life above all else. When I look at it through that lens and see the bigger picture, I know that my creative spirit was forged in the fire, and that I can forgive those people because they were part of one big, messy, painful soul plan that helped me step into my power. I mean, how could we have let ourselves settle for less, or ignore our intuition, or stay in an abusive situation, or allow other people's opinions to shape us so thoroughly, or believe what that rejection letter said about work we knew was true to our heart? I try to remember that we all show up with a stunted child inside, or with a family wound, or with an unconscious pattern, and when I remember that it becomes a lot easier to give myself a break. Every one of us has been hurt by other people. The question is, will we keep letting that pain hold us back from our creative destiny, or will we release it and move forward? Oh Desert, You Are My Muse! After I kicked my starving artist to the curb over a year ago, it freed me up to envision an abundant new life. The main focus of this new life was to create a mobile lifestyle, so I could work anywhere. Once that happened I decided that "anywhere" was New Mexico, a place I'd dreamed of living for more than a decade. This week marks the end of a four-month stint working and traveling in the aptly named "Land of Enchantment." My experience with the land, animals, people and flora have been nothing short of soul-satisfying and life-changing. Daily, I found inspiration in the light, the textures, the shapes, the colors, and perhaps even, the soul of things. New Mexico has truly called forth a deepening of Possibility (yes, capital P), and a serious boost to my creative state.